A plastic tunnel attached to the side of a supermarket has become the highest rated TripAdvisor attraction in a Cornish seaside resort. 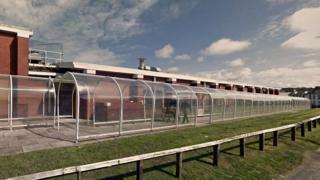 The 70m (230ft) structure in Bude has racked up more than 160 comments with the majority rating it "excellent". Those commenting have jokingly likened it to the Taj Mahal and called it "one of the seven wonders". Its profile says "nowhere else in Bude can you walk this far undercover in a continuous straight line". The person who originally listed the tunnel, who wishes to remain anonymous, said they did so because it was "one I have admired for a while", and they "never thought that it would become this popular". They have also been selling postcards depicting the tunnel in the town to raise money for the Bude Sea Pool, a popular attraction. They said: "It's been a great talking point in the town, and one that seems to have brought everyone together. That's fantastic. "It's great that as well as being a bit of fun, it will raise a little bit of money for one of the town's real attractions." One woman, who gave an "excellent" rating, commented that the tunnel was a "great place for a divorce". She said: "Took my ex-husband, (husband at the time), to the tunnel to break things off and inform him about the divorce. "The walk back through the elongated tunnel felt like the first step towards freedom from Steven and his massive collection of recorders. Best moment of my life." The tunnel links shoppers from the Sainsbury's supermarket to the car park, protecting them from the rain. A Sainsbury's spokesperson said: "It's clear that visitors to Bude have seen the light at the end of this tunnel." Mark Hibbard, from Bude Area Tourist Board, said reviews people read online were unregulated and the town "has so much to offer visitors". "I hope that the Bude Tunnel being rated as the number one attraction in Bude does not become detrimental to the 'real' things to do and visit in our town," he said.